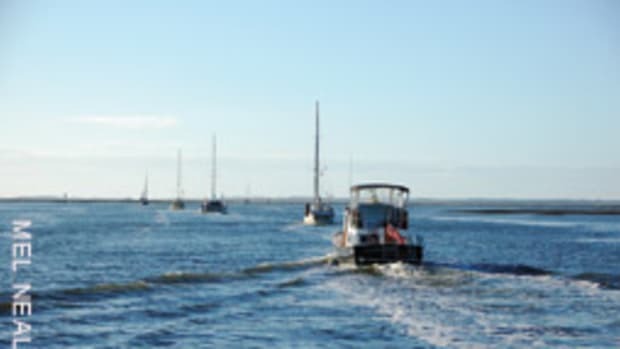 Every year, cruising websites fill with “breaking news” and panicked reports about boats running aground as they head south on the Atlantic Intracoastal Waterway. Tips are posted on how to get through these treacherous areas, and a week or so later there are often new tips that say the previous ones are no longer valid. This is the stuff that sells guides and magazines, which is good, because quality guides, charts and helpful magazine articles can be invaluable. But there’s far more to it. The “more to it” is that this has been happening for the life of the ICW — and actually for thousands of years before. Usually these treacherous traps occur in the same general areas and for the same general reasons. It’s not new at all. It’s more likely that Capt. 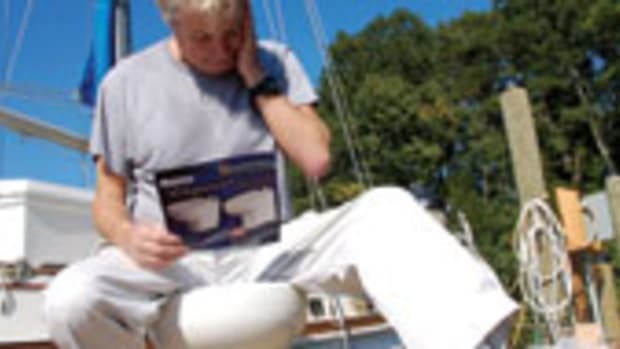 Johnny has just made his first or second trip down and has, as everybody else claims, “run aground in the middle of the channel.” Like most good boaters, he’s anxious to help others, and although it’s helpful in the very short term, rediscovering the wheel doesn’t go very far toward solving the problems long-term. Here, we’ll look at some examples of areas of the ICW where, over our many years of travel, we’ve seen persistent problems and why. When you have some understanding of the “why,” you’re a little better armed to stay out of trouble, both in the ICW and in many other areas where you may boat. 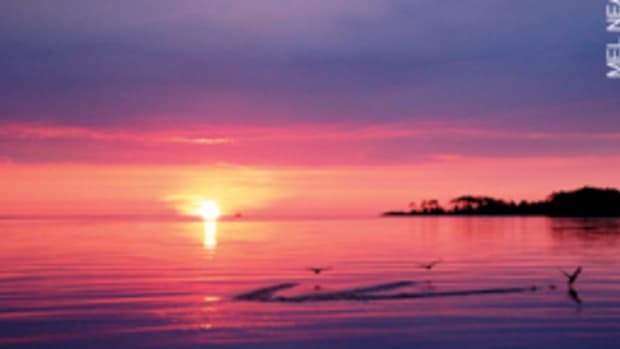 After you’ve left Norfolk, Va., and crossed the Virginia-North Carolina line in the North Landing River, you eventually head out into the North River, which empties into Albemarle Sound. Boats frequently run aground where the river and sound meet. 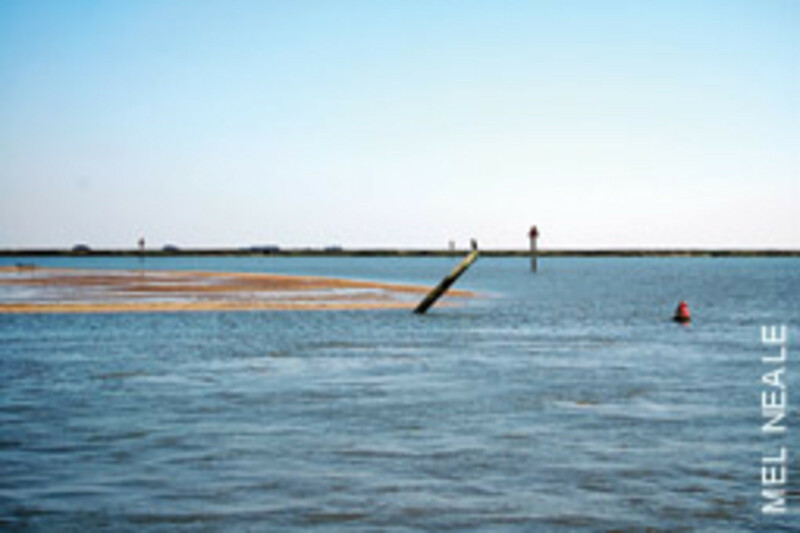 The charts show that the deep channel in this very broad, shallow area is created by dredging and that exceptionally shallow banks of dredge material line the channel. The next lesson comes on the other side of the Albemarle. Once again, the wide-open waters of the sound meet the ICW channel here in the mouth of the broad Alligator River. This river has flowed northerly through swamp and forest, fed by creeks and rains. It has a broad creek near the western side of its mouth and a creek and beautiful swampy lake on its shore just in and to the east of its junction with the sound. When you consider that waves from the sound, joined by waves and wind-driven current from the river — all carrying and moving about silt — meet at this junction, it doesn’t take much to conclude that there’s going to be constant shoaling here. To keep the ICW open, the Army Corps of Engineers dredged a passage through the shallow water so boats could pass straight from the Alligator to the Albemarle. But for the same reason as on the north side of the sound, waves tend to wash the spoil material, of necessity placed on the side, into the deeper water. The Corps is not oblivious to natural forces and utilizes them when it can to help attain as stable a channel as it can in very adverse circumstances. For years here the dredged channel had a small dogleg in it between the shoals, presumably to match to some extent the natural flow and to avoid the harder bottom running out on either side. Boats for years overlooked the dogleg and went aground. Soon enough, it would be reported, “It’s shoaling to 3 feet in the middle of the channel,” when in actuality the skipper was out of the channel. Studying the geography and underwater topography with a smidgen of attention given to natural forces, not to mention ATONs, makes this much less of a mystery. And there is yet another set of strong clues here if you are paying attention and see them: duck blinds. You don’t build these in deep water. The shoals running out to the small channel, particularly on the western side, have duck blinds. When you see duck blinds, don’t go there. Let’s look at a less complicated area but one that has fostered perhaps even more anguished reports. It’s the dredged area in North Carolina just to the north of the Onslow Beach Bridge. It runs through the firing range of Camp Lejeune. Sometimes it’s closed as cannons boom and shells whistle over the ICW. It’s very close to the ocean beach, and a few creeks enter the channel from the ocean side. These are fed by both Bear and Browns inlets. The narrow ICW is separated from the Atlantic by only a small barrier of sand and marsh, and the water flooding in from the rising tides in the ocean has little to slow it down before it enters the ICW channel. A shallow ridge regularly forms underwater off one of these creeks. 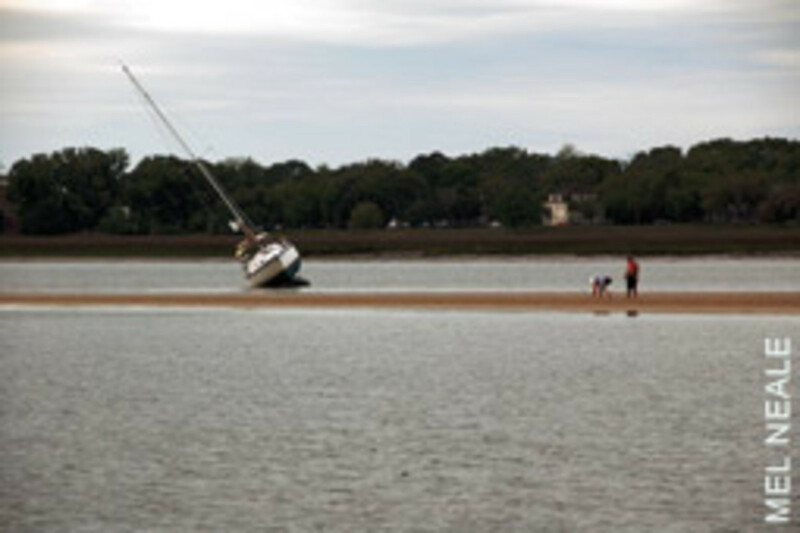 Boats bump; some go hard aground. It’s very simple. Water rushed in with the tide carrying sand and silt into the channel. Currents in the channel help to pile it up. This phenomenon is even more conspicuous in other areas. One of the more notorious is the long stretch of the ICW just north of Charleston. 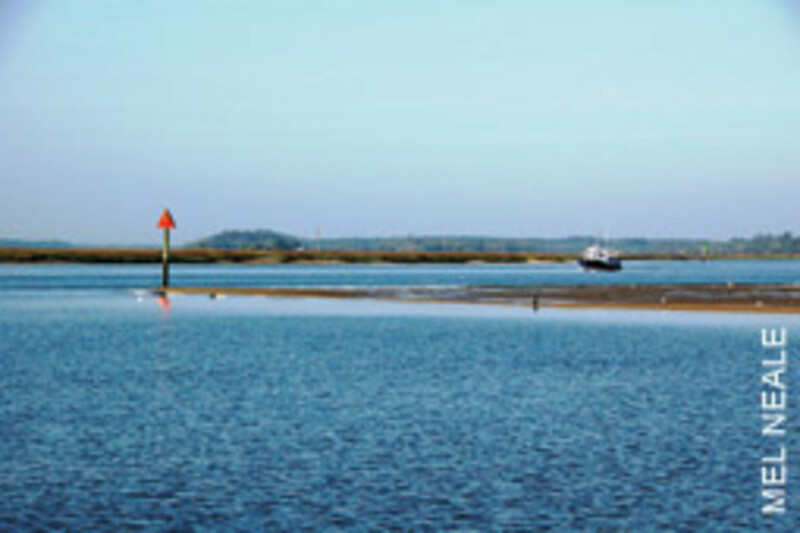 The ICW was dredged through the marsh, close to the ocean, across which the flowing waters of many creeks pass. Sometimes you can see the ocean waiting outside these creeks. The tidal range can be about 6 feet in this area. That’s a huge volume of water flowing in and out of the marshes, at great speed. When the waters of the creeks flood across the ICW channel, they can move a huge amount of bottom with them. When the fast-flowing waters of the ICW channel interact with the creek movement, they can create some significant reshaping of the bottom. This area regularly shoals, and boats regularly go aground. One lesson that’s common in most of these groundings is that the skipper who’s passing the creek coming in from the side sees the water swirling, sees that ATON ahead and is intent on watching it. He is not intent on also watching the ATON that he left astern or landmarks ahead or astern that he can use as ranges. This is critically important because if you’re just watching the ATON ahead, you can be keeping your bow pointing to the right spot, even though the current is setting you off to the side. You’ll never know it until you hit, far to the side of the channel, unless you’ve established and followed a range to keep you in the middle. And unless there’s a good set of range markers ahead, or a good tree or two, you’re going to have to be looking astern as well as ahead to be sure you aren’t being pushed out of the channel. Other topography similar to that described above can cause even more pronounced problems — for example, where ocean inlets course into the ICW. 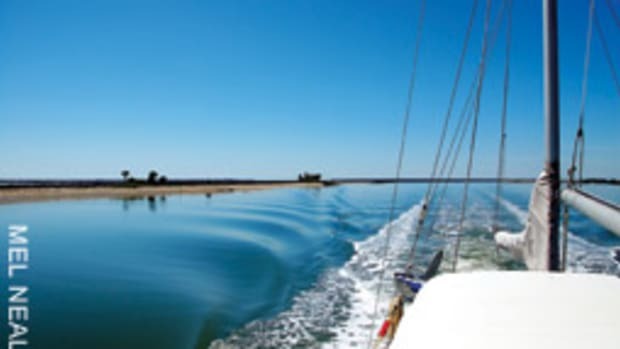 Many inlets are spectacular because you can look out into the ocean as you travel safely inside, seeing the huge waves breaking on the shoals or the beautiful calm swells of a sea at ease. But you’re not inside as “safely” as you may think because the huge amounts of water flooding unfettered by shallows and bends of creeks, in from and out to the ocean, can play massive tricks, even with constant dredging. This is especially true if that inlet is the opening not of a creek but of a river that flows inland on the mainland side of the ICW. The New River Inlet in North Carolina is a fitting example. The inlet from the ocean is relatively wide but also shallow in many areas as it runs through high, loose dunes. Some of these dunes are actually made from spoil piled up from years of dredging. The bottom is mostly sandy. The New River also introduces strong current to the ICW, and the ICW itself brings current to the junction, draining large areas of marsh and creeks, first from one side and then the other, as the tide rises and falls. As the waters from the ocean entwine with the waters from the broad river and the ICW, the bottom of the ICW becomes convoluted with shoals, often in areas that are very difficult to predict. Swirls of subsurface current are influenced by many bottom contours and other factors, and a buoy placed in the “right” place today may be very much in the wrong place tomorrow. The inlets of Lockwoods Folly and Shallotte are other examples. In these places, you look right out at the ocean. But the ocean waters typically pile up sand near the middle of the ICW crossing of the inlet, and often at either end, as they collide with the currents from the actual ICW. Sometimes they pile up the water along the bank of the mainland shore, but more often they stack it up on the ocean side of the ICW channel, again because of the confluence of currents from the northern and southern approaches of the ICW, the river and the ocean waters. Let’s move on to a different type of problem area, more likely to be found in the long, low flat marshes of South Carolina and Georgia. A beautiful feature of these areas is the labyrinth of long, winding rivers. 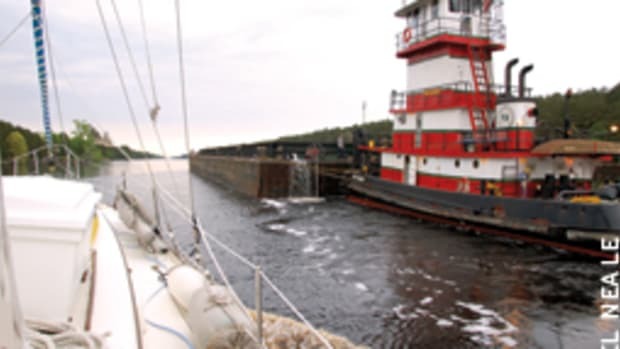 But for the ICW to pass through that world, many cuts have been dredged connecting one river to another, or to bypass a long, constantly shoaling snaking bend. So you have a totally (or mostly) artificial dredged channel through the marsh with a strong, flowing river at each end. Remember, the tides here can range from 6 to 8 feet, and currents are mighty. At the end of each cut, water flows either out of or into the cut, depending on the tide and the influence of the river at either end. Also, the full force of those rivers flows past the end of each cut, and again depending on the tide and the effect of the rivers at each end, they flow not only past but also into the ends of the cut. This obviously can make a mess of the bottom even a short time after dredging. A great example of this would be the Ashepoo-Coosaw Cutoff between those two rivers. They are strong rivers, full of not only deep water but also shifting shoals. There are ample shoals in Rock Creek, which joins the two sections of the Ashepoo-Coosaw Cutoff just south of Mile 515. Small wonder that they might drift some toward the ICW channel. Traveling along almost any creek or river, you’ll be rounding bends. Songs have romanticized this, but few have romanticized the curse words sometimes hurled into the air in their vicinity. Bends in the river, almost by definition, are going to change the course of the current. They will deflect it to the side, cause it to swirl and eddy, jam it up altogether and do other things. This frequently means that some of the silt and sand borne along on the current is going to be deposited in some area near the bend. Figuring out where the shoal might lie was one of the skills — learned by many years of training — of the old Mississippi steamboat captains. As difficult as that was, learning about shoaling around bends in coastal areas may, in some places, be more difficult because the current usually reverses back and forth with the tides. This subject alone could fill a book. Look for eddies, areas of fast-moving water and areas of still water that could denote very shallow depths or very deep holes. Current rippling when there is no wind may be a clue that it’s meeting an obstruction. In certain parts of the country, if you see a line of crab pots, odds are it follows the edge of a shoal. Another favorite feature is the “unreported obstruction” in the “middle of the channel.” These do occur, but let’s look at some of the causes. Anytime there has been a bad storm, wind is likely to blow trees over, and flooding creeks and rivers are likely to carry them to where you’re navigating. The high waters and currents may also carry along trees and stumps that had long been down but were stuck safely in place. These may be waterlogged and float between the surface and the bottom. When the current slows, as at a bend or where the river widens, they may settle and lodge in the bottom again — this time in the channel. But it doesn’t take a storm to create unreported obstructions. There are many places in the ICW and elsewhere that have old, toppled trees cluttering the banks. One that quickly comes to mind is the Waccamaw River in South Carolina. To clear the trees, various entities have often piled them up along the sides. Sometimes old trunks and limbs will settle into the deeper water. Sometimes a rotten limb will fall from an overhanging tree and settle down. Then comes a sportfishing boat with powerful engines and props — or worse still, a mighty tug. The wakes these boats throw belie the fact that their props are moving a huge amount of water underneath. On many occasions, we’ve seen boats following large sportboats and tugs hit huge logs or tree trunks that were lying peacefully out of the way in the mud until the whirling waters from large props overhead washed them up to crash into the boat behind. There are tactics and although they’re not really magic and you can’t count on them to work every time, they are usually helpful. The first is to travel at half-tide and rising when you expect to encounter problem areas. It may cost you time, but the consequences of failing to do this may cost you a lot more. 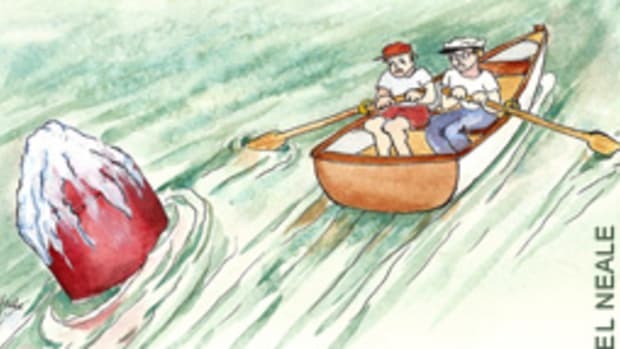 If you go aground and it isn’t too hard and you haven’t torn up your running gear, you can generally wait a little while and just float off. 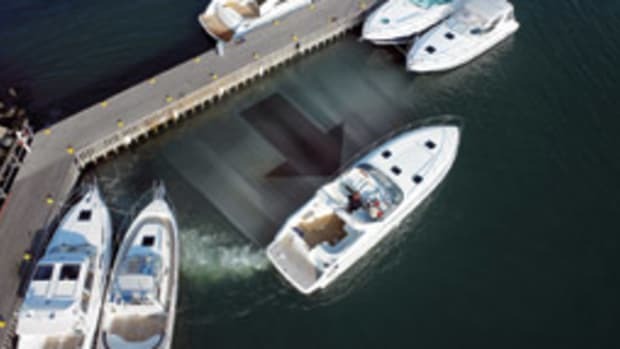 If you call a towboat, the service should tell you the same, and it’ll be a soft grounding, rather than one that can cost a lot more in fees and might even exceed the type of insurance you have. We all know we’re supposed to keep our charts up to date, but this can be a complex job and few of us do it. If your paper and electronic charts are older, consider checking out the online chart viewer at www.charts.noaa.gov whenever you are passing through a questionable area. Or you can download full reduced-scale charts in booklet form at www.nauticalcharts.noaa.gov. 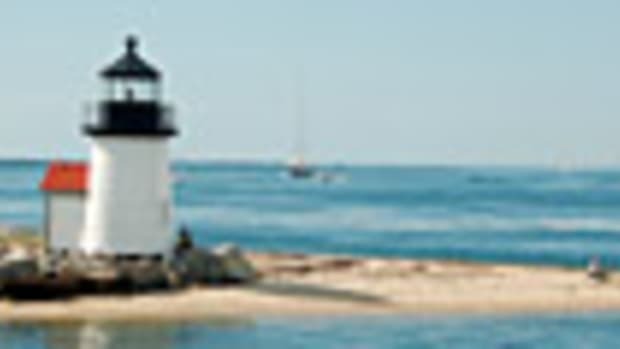 These charts are updated to the latest weekly Coast Guard Local Notices to Mariners. Individual pages can be printed to supplement your older paper and electronic charts. Note that the magenta line showing the ICW route on many charts should not be relied upon. It may be missing from some updated charts where channels frequently shift, or it may not have been changed when ATONs were relocated. One trick that comes close to magic is learning to take advantage of some of the best technology around and the work product of some extremely good, well-trained folks — the surveyors of the Army Corps of Engineers. To the extent that budget and time allow, these people are regularly surveying problem areas below the water with very sophisticated equipment and precisely charting it. You can go online to find exactly where the water is and isn’t (www.saw.usace.army.mil, www.sac.usace.army.mil, www.sas.usace.army.mil.) It may take you a few minutes to figure it out, but consider it part of being a good navigator. Yet another magic bullet is a visit to the East Coast Alerts at www.boatus.com (search East Coast Alerts). This is a compilation of reports and observations by known sources, Notices to Mariners, USACE survey reports and other info prepared by my wife, Mel, and me and available at no cost on the BoatUS site. If you are a member you can sign up and get the alerts emailed to you. A final tactic that seldom if ever fails is to watch for seagulls walking on the water. Despite the fact that our all-knowing government has designated them as “protected,” they can’t walk on the water. When you see them defying the laws of physics, it’s no miracle — just a place you don’t want to be.